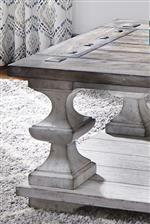 Add a rich, Spanish influenced design to your home with the Sedona collection of occasional tables. A rustic, distressed finish has been applied over oak veneers and hardwood solids to give this collection an inviting presence. Bold, Spanish style turned legs are paired with heavy planked tops and square peg accents to complete the traditional look.